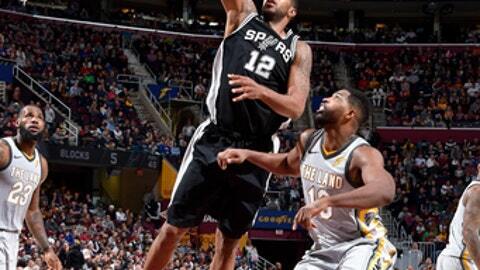 CLEVELAND (AP) The Spurs ended their ”rodeo” road trip by roping the Cavaliers. San Antonio was called for just 12 personal fouls – only three in the second half- and shot 32 free throws compared to 14 for Cleveland. Kyle Korver’s 3-pointer with 4:47 left brought the Cavs within 96-88, but Patty Mills countered with a 3 for the Spurs. Cavaliers: F Larry Nance Jr. wore No. 22 – his father’s retired number – for the first time since he was traded to Cleveland. The NBA granted Nance permission to switch jersey numbers (he had been wearing No. 24). … Thompson had a season-high 13 rebounds in 23 minutes. … Golfer Jason Day and NFL players Ryan Shazier and Ted Ginn Jr. were among the celebrities in attendance. … Dropped to 39-10 against Western Conference teams at home since Jan. 21, 2015. … James passed Rod Strickland (7,987) for 11th place on career assists list.